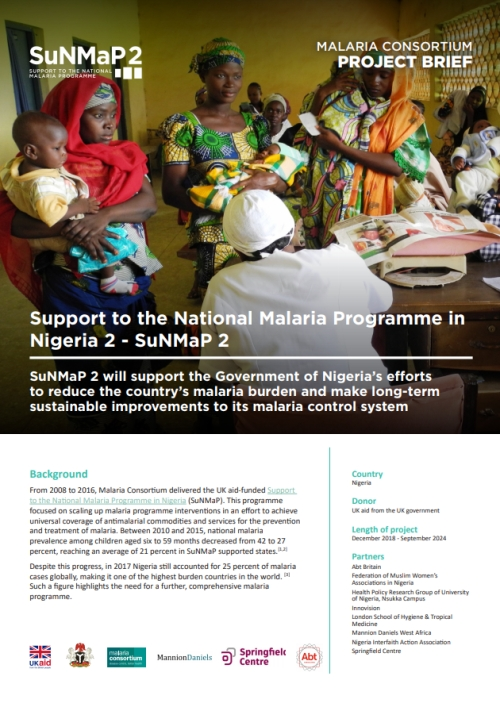 SuNMaP 2 is a UK aid-funded follow-up to SuNMaP that will support government efforts to further reduce Nigeria’s malaria burden. The programme will be implemented by Malaria Consortium and will integrate malaria prevention, treatment, and other interventions at the community and service delivery levels, as well as in other settings, through public and private sector partnerships. It aims to improve the planning, financing and delivery of sustainable malaria programmes across 165 local government areas in six states of Nigeria: Jigawa, Kaduna, Kano, Katsina, Lagos, and Yobe.